Laurie Ann Hous is the lead vocalist of Autumn Tears, who have released 5 excellent albums of neoclassical experimental music with amazing aethereal female vocals. 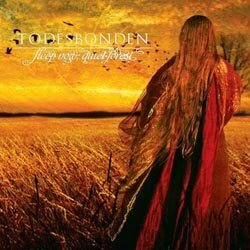 In 2003 she formed Todesbonden and together with Jason Aaron Wood (Ol Sonuf, Rain Fell Within, Ephemeral Sun) on guitars and Patrick Geddes on violin they released in 2004 the “Stormbringer” EP. Now with a more complete line-up and a deal with Prophecy Productions they return offering us this masterpiece! It’s not easy to define their music since they extend from gothic metal and rock, to folk, classical and ethnic music! Piano, violins and electric guitars blended skillfully, build the perfect setting for Laurie’s characteristic vocals. If you let yourself in their music you will enter a beautiful tranquil magical world. The compositions have a great variety of influences and each of the songs has its own identity. Balkan, renaissance, classical, aethereal, Middle Eastern, Spanish, Celtic, Mexican music elements, all of them are in pure harmony with each other. The melodies are really brilliant in a very melancholic mood. Words are just too weak to describe them. I don’t think I’ve ever heard anything better in this genre, both in music and performance. Laurie Ann Haus both in Todesbonden and Autumn Tears is in my opinion by far the best female singer around in this genre, with her unique operatic vocals enchanting my ears! This is another quality release from Prophecy that you shouldn’t miss if you like this kind of music! Except for the normal version it’s also available in a digipak edition, both of them with great artwork and photography. Currently the band is working on its next album. You can get a taste at the links below.